I remember summer ‘93. I remember begging my parents to take to me to see a new dinosaur movie. I was already obsessed with them anyway – with more toy models than you could shake a fossil at. Finding out there was going to be a whole movie about dinosaurs blew my 5-year-old mind. And what a movie it was, winning three Academy Awards and since appearing on numerous ‘top films of all time’ lists. But along with inexplicable weight gain, age brings with it an ability to look back on what has gone before with fresh clarity. 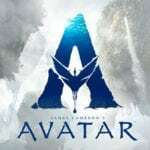 There has to be something beyond the technical achievements and classic Michael Crichton theme of science vs. nature that makes the movie connect to audiences on a primordial level. And as I’ve gotten older, I’ve mused to myself (and people in the pub) that Jurassic Park isn’t really about dinosaurs at all. It’s about life succeeding through love, family and the evolutionary instinct to further the species. Romantic stuff. Jurassic Park, however, is bright and optimistic. Which is perhaps why it still packs more emotional weight than the reboot, despite the two films having a similar basic premise. 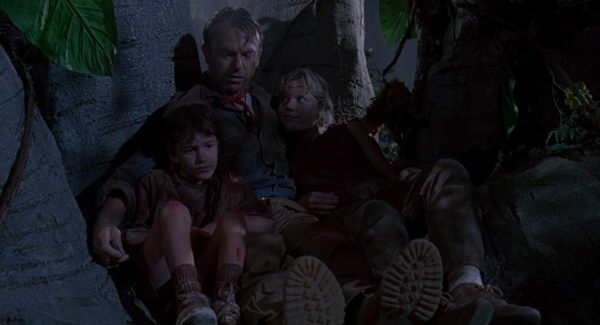 Somehow, the original Jurassic ends on a more poignant note – with the feeling that both the humans and the dinosaurs are in a better place at the end. 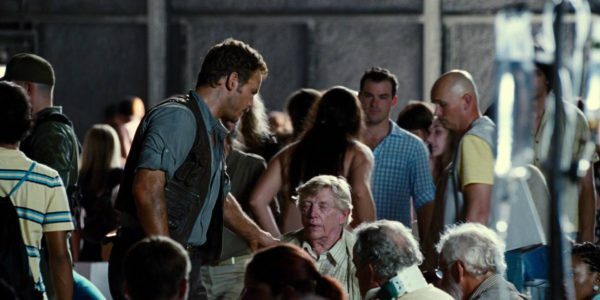 Jurassic World’s final scene arguably feels more like everyone has just woken up from a drunken stupor. 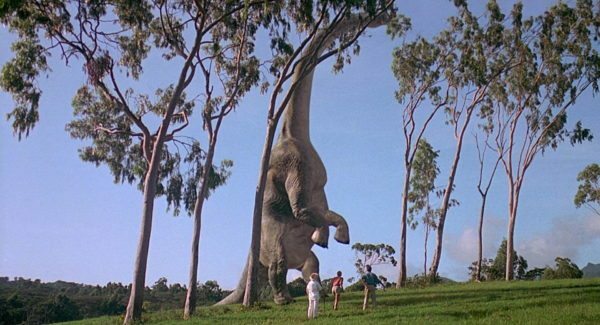 The original Jurassic is one of the only films in the franchise with characters you’d really root for. 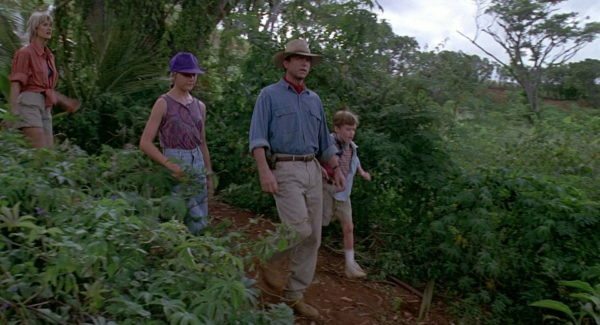 We’re introduced to Sam Neill’s Dr Alan Grant as a paleontologist examining the scan of a dinosaur fossil with a team of wonderfully 90s extras – collectively sporting more double denim than a vintage Levi’s ad. But this segues into a protracted scene with Grant berating a child for not respecting him enough. This is clearly a man who is not a ‘kid person’. That’s a thing many of us can relate to. I love my niece and nephew, but I still feel that I’m a bit of a leap away from fatherhood. In contrast, we know Laura Dern’s Ellie Sattler loves kids. She outright tells Grant that she wants them in the following scene, and so we’re aware of a rift between the couple. But it could be that trying to deny himself his natural evolutionary instinct to make little Alans and Ellies could be bad for nature. Life needs to find a way. The events on the island are just as much about Alan growing towards this epiphany than it is about dinosaurs killing people. And that’s why Jurassic Park really works. As the helicopter makes its descent towards Jurassic Park, hilarity ensues as it turns out Dr Grant doesn’t have a working seatbelt. 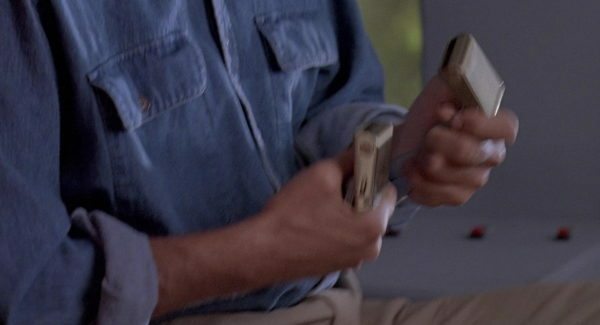 Indeed, he has two female plugs – and this happens just prior to the audience learning that all the dinosaurs on the island are female, to prevent unauthorised breeding. Yet even in this case life finds a way, as Alan improvises by simply tying the two ends together. And we’re reminded that ‘life finds a way’ throughout the movie. Jeff ‘Ripped like a Raptor’ Goldblum’s Ian Malcolm first utters the phrase on the tour of the lab, commenting that “…life will not be contained. Life breaks free, it expands to new territories and crashes through barriers, painfully, maybe even dangerously…”. Grant later echoes Malcolm when he sees a clutch of dinosaur eggs in the wild which have hatched. We can see nature beginning to take its course on the island, with dinosaurs breeding like rabbits, and Grant beginning to grow some paternal instinct. After being duped by Ellie to share a tour car with John Hammond’s grandchildren, Lex and Tim (“She said I should ride with you, because it would be good for you!”), Grant opts to do the adult thing when the T-Rex escapes by saving them from certain death rather than diving for cover in the nearest public toilet. It’s a touching moment to see Grant let the kids tuck themselves in under his arms for the night in the jungle after we’ve seen him pull Lex from an upside-down car, abseil with her down a sheer concrete drop, and rescue Tim from the same car after the Rex flung it into a tree. We’re there for every step of their trek across the island, and this journey is as important to the kids as it is for Grant, as Lex and Tim’s real parental figures are absent for the time being. Even before we’ve met any of the main cast, the second scene of the movie reveals that Hammond has been absent from the park because his daughter is getting a divorce. Hammond himself reiterates this during the kids’ introduction later, at the Visitors Centre. 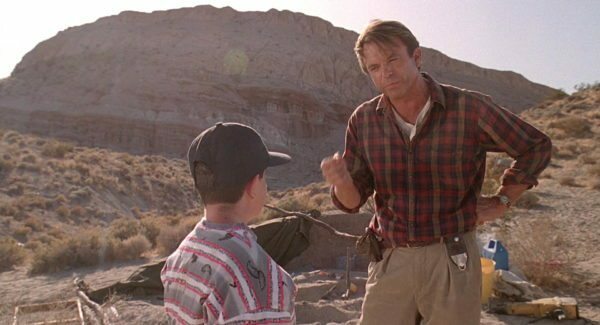 Grant will go on to play father figure throughout the film, evading a stampeding herd of Gallimimus and rescuing Tim from an electrified fence as the power comes back on. He begins to genuinely connect with them as a father figure, sharing touching moments usually associated with a parent and child – such as petting the brachiosaurus (“Just think of him as, kind of a big cow”) and gently scolding them when their sibling rivalry gets too much (“Come on guys, it’s not a race”). As Grant grows into his new role as a father, he begins to realise it’s time to move on. As they drift off to sleep together, the kids ask him what he and Ellie will do now they don’t have to dig up dinosaur bones. He replies, “I guess we’ll have to evolve, too.” Of course, they can no longer be old-fashioned paleontologists – but they’re also going to have to change if they’re going to survive as a couple. 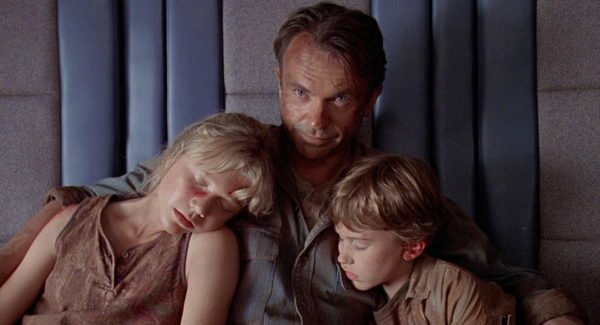 Grant’s fatherly instincts are essential to his arc through the film and, in case we were in any doubt, Spielberg sends us clear visual signals that this the new family unit of the movie. 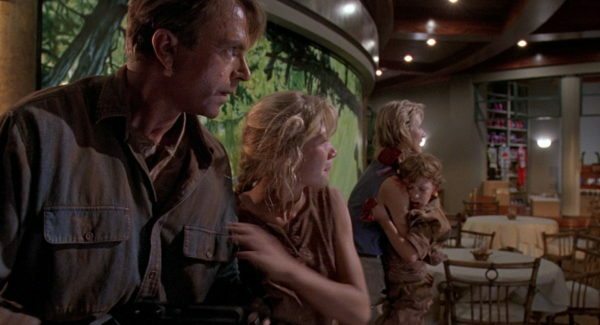 He hints at this relatively early on, framing Alan, Ellie and the children in the same shot before they see the sick triceratops, for example. And then later in the movie, as the kids literally run into the arms of the pair, fleeing the raptors from the kitchen and retreating to the control room. 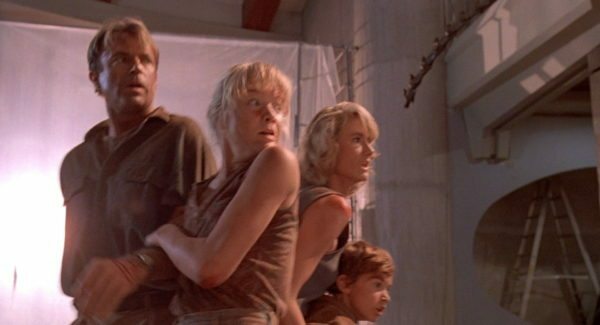 By the time the raptors have chased them back into the Visitors Centre lobby, almost every shot of the human cast members features the family unit. In the control room itself, the ‘family’ has to work together as a team, with Alan and Ellie holding the door shut as Lex uses her computer smarts to finally turn the power back on and get the door locks to kick in. Okay, there’s definitely an argument that Tim could have grabbed the discarded shotgun for Ellie, but perhaps having a minor handle a firearm is simply too much for this PG-13 movie. The birth of a family is how life truly finds a way in the film. Alan gets over his distain for kids, so he and Ellie can now move forward as a couple – and the kids get to have loving parental figures who will help them make it through the island alive, even as their own real-life parents are in the middle of a divorce. This emotional climax builds to its crescendo when the survivors make it onto the helicopter. To a soundtrack of John Williams’ gentle piano lullaby rendition of the Jurassic Park theme, Ellie smiles lovingly as she gazes at Alan and the kids. He looks back at her and seems to know precisely what she’s thinking. He’s finally grown. They both glance out of the window at a flock of pelicans flying over the ocean – the lives of the cloned dinosaurs may have been doomed, but life found a way to beat extinction 65 million years ago. The dinosaurs evolved. And now, Alan and Ellie have, too. You don’t stand the test of time with groundbreaking CGI and thrilling set pieces alone. You do it with a movie that speaks to us as people, and maybe even as a species. A film about innate, unconditional love and the evolutionary impulse to survive. Jurassic Park isn’t about dinosaurs. But then again, they are fantastic fun. Luke Littleboy – Luke records a film podcast and writes a few words at One Sensational Shot. He has been a film fan since first seeing Jurassic Park at the Odeon in Ipswich, UK back in ’93. The Odeon is gone but the doughy-eyed sense of idealism remains.